Despite some underwhelming moments, Sony’s new PlayStation Platinum Wireless Headset is a great-sounding, ultra-comfortable pair of cans that can make some of the best looking games sound even better. We have to hand it to Sony. We love when console manufacturers pack at least a very basic headset with each and every console they ship out. Microsoft did it for the Xbox 360 and then totally failed to follow through for the Xbox One, packing one only into specific models. That said, while we love the pack-in PS4 mono headset that serves as a gateway into the world to voice chat and audio playback, for most gamers it just doesn’t cut it. But that’s why Sony is introducing the sequel to 2014’s PlayStation Gold Headset, the all-new PlayStation Platinum Wireless Headset. So what’s the difference between the two? Besides a slight style change, Sony’s Platinum pair of cans are the first to offer 3D surround sound – it’s like 7.1 virtual surround sound on steroids. Only a few game developers are building it into their games at the moment (actually it’s just one: Naughty Dog for Uncharted 4: A Thief’s End) but down the road it could be a staple of all first-party PlayStation titles. We spent an afternoon with Sony’s new premium pair of cans and liked what we heard. Audio from games, movies and music comes through crystal clear – which was almost a given considering the Platinum’s $159/£129/AU$259 price tag – but we were shocked just how well it worked compared to the third-party peripherals we were used to using. 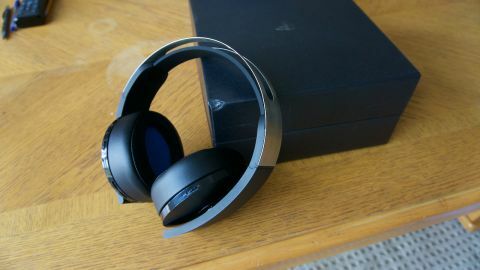 And whereas other headsets can take awhile to figure out, Sony’s cans benefit from being first-party hardware meaning that it takes mere minutes to unbox, plug in and get going. It helps, obviously, that these are completely wireless headphones. Plug the included wireless dongle into the PS4, change the output from the TV to the headphones and you’re more or less ready to jump into the action online. Before we dive too deep into performance, however, let’s focus on the design of the headset. The Platinum Wireless is an interesting mix of plastic, metal and rubber. The top band consists of two metal bars that offer a lot of rigidity and hold the headset firmly in place. Beneath the top band is a rubber strap that cradles the top of the noggin, and then all the rest is plastic. The headphones fold up neatly, perfect if you need to take them with you, and are a medium weight – not too heavy, but not so light that they feel breakable, either. If you’re looking for an exact number, the Platinum Headset weighs 318.2g. Finally, the earpads themselves are made from a comfortable pleather material that gets a bit warm after some use, but doesn’t have a terrible amount of clamping force either. We found that we could wear the headphones for about two-hour increments before we had to take them off for a breather. On the debit side though, these are far from the most stylish-looking headphones we’ve ever worn. The oversized earcups and double band bridge give it a sort of monstrous quality, like they were designed for a giant’s head rather than regular people. That said, while the headphones work on mobile devices, they probably wouldn’t be the pair of cans you’d take to the gym or elsewhere and thus maybe the design won’t bother you as much as it did us. The metal, plastic and pleather coalesce into a comfortable – if a bit obtuse – pair of cans. Sony’s Platinum Headset is a surprisingly balanced piece of kit. The low-end comes on strong, but never overbearing, and it really shines with mids and highs. Listening to movies and music may not be the headset’s intended purpose, but it’s certainly no slouch in either of those areas. These actually make for a pretty good pair of replacement headphones if you want something to wear while just sitting on the couch watching the TV. In fact, dollar-for-dollar or pound-for-pound, it’s tough to think of a headset that offers better value for your money. Generally speaking this is probably one of the best-sounding gaming headsets on the market today. Of course, that being said, there are headsets out there that offer more pronounced surround sound – one area that we felt the Platinum’s could’ve improved upon. Footsteps and gunfire imparted a general sense of directionality, but they didn’t have the same precision on Sony’s PlayStation Platinum as we’ve heard on other headsets. That point changes slightly when you’re playing a game that uses 3D surround sound instead of simulated 7.1 – again, Uncharted 4: A Thief’s End is the only one that offers it at the moment – and sound effects do have a better presence thanks to 3D Audio’s ability to create “100 virtual speakers”. Playing through Drake’s latest adventure with the Platinum headphones on gave the cinematic video experience a matching aural one similar what you’d find at a movie theater. Obviously it wasn’t as immersive as using a traditional 7.1 speaker setup, but the Platinum Headset did help us realize the level of detail the development team at Naughty Dog put into the game. Should you decide you want to go back to stereo sound, however, all you need to do is flip a switch on the right earcup and you’ll drop back down to two-channel sound. In terms of microphone quality, friends that we spoke to all said that the sound quality was “above average” – in part, we think, due to the noise-cancellation software Sony packed into the Platinum. It’s unable to completely cancel out background noise (it can’t cut out the noise of a dog barking, for example) but it does help reduce the ambient noise that some other headsets are known to pick up. Should you need to mute the headset at any time, or raise or lower the volume, you can find a row of skinny buttons along the outside rim of the left cup. Sony doesn’t quote a target number for the headset’s battery life, but if we had to do an estimate based on the time we’ve used it, it’s probably around the 12- to 14-hour mark. We were able to play on and off for an eight-hour period, and we barely dove past the two-thirds mark according to the PS4. Now, of course that might be different if you’re using different audio levels (if, say, you like to listen to extremely loud audio) and are constantly chatting to friends, but for the average user it’s fair to expect around a dozen hours before it’s time to plug back in. Obviously one of the the headset’s major selling points is its ability to go wireless but, should you decide to run it into a mobile device or your brand-new PlayStation VR, Sony includes a standard 3.5mm-to-3.5mm audio cable inside every box. Inside you’ll also find a micro-USB cable, the wireless dongle and a soft cloth carrying pouch. The basic audio cable should allow you to plug it into any 3.5mm jack and draw out audio, and act as a headset for most mobile phones. There’s plenty nice to say about Sony’s new pair of Platinum Wireless Headphones. They have exceptional – and balanced – audio performance and the mic sounds “above average” according to the people we spoke to. There’s also 3D Audio support that creates 100 virtual speakers, though honestly the headset doesn’t have the same panache in this area that you’d find on the competition’s pair of cans. Speaking of, a lot could be done in the design department to make them look a lot less massive sitting on top of your head, and despite two metal alloy bars floating across the top, the headset’s plastic sections feel fragile. All said, though, it’s hard to find a better value headset that’s this easy to use and sounds this good overall. Those qualities definitely exist at a higher price, but if you’re looking for something you can set up without a fuss, Platinum is a gamer’s best friend.